LAS VEGAS, NV--(Marketwired - Apr 18, 2016) - This week the 2016 NAB show, Promise Technology Inc., a leading rich media storage technology provider, is previewing exciting new solutions. On display are products built around the recently released Thunderbolt 3 interface addressing the many Windows-based workstations and notebooks already shipping with Thunderbolt 3 ports. Promise is also providing demonstrations of the new VTrak E5000 16G Fiber Channel storage array bringing blazing speed to the entire rich media workflow from ingest and editing to delivery and long term archiving. Promise's Pegasus3 Series with Thunderbolt 3 technology delivers blistering performance speeds for creative professionals working with high resolution video and rich media content. At 40 Gbps, Thunderbolt 3 provides for twice the bandwidth of its predecessor, Thunderbolt 2. To take full advantage of this bandwidth, Promise's new Pegasus3 line will be available in 4-bay, 6-bay, and 8-bay configurations. 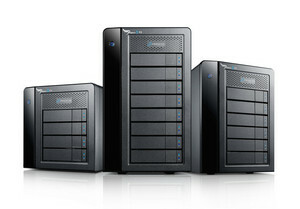 In its third generation, the Pegasus line has been the first choice for direct-attached storage for media professionals requiring reliable, fast connectivity with their workstations. The Pegasus3 R4, R6, and R8 models have two Thunderbolt 3 ports to allow for the daisy chaining of other peripherals using Thunderbolt 3. A DisplayPort connection has been added, offering the convenience of hooking up a display monitor without having to obtain a breakout device. Promise will also be introducing versions of its SANLink line-up with the SANLink3 16G Fiber Channel interface and the SANLink3 NBASE-T Ethernet interface. These two Thunderbolt 3 interfaces will allow blazing fast data speeds to be realized from Thunderbolt 3-enabled workstations and laptops. The SANLink3 models allow for interfacing Thunderbolt 3 into an Ethernet or Fibre Channel infrastructure. The bus-powered SANLink3 T1 model interfaces with a single Thunderbolt 3 port to a single NBASE-T Ethernet port, supporting 2.5, 5 or 10Gbps speeds. This model is even more compact and is completely powered by the increased bus power provided for with the Thunderbolt 3 protocol. The SANLink3 16G FC interfaces with two Thunderbolt 3 ports to two Fiber Channel ports, all in a compact design. In order to use a Thunderbolt 3 storage system or bridge adapter, a Thunderbolt 3-enabled laptop or workstation is required, as they are not compatible with earlier Thunderbolt 2 models. Promise has begun the certification process for the Pegasus 3 and SANLink 3 models, and the expected delivery is the beginning of summer 2016. Promise will continue to provide the Thunderbolt 2-based solutions for users with Thunderbolt 2 laptops and workstations. "We have always prided ourselves on being the first to provide RAID storage and interface adapters based on the very latest Thunderbolt technologies," noted Vijay Char, president, Promise Technology USA. "Once again, we are leading the charge and paving the way forward for our valued customers looking for Thunderbolt 3. And, with Thunderbolt 3-enabled Windows workstations and laptops already entering the market, our timing could not be better." A brand new VTrak E-Class array -- the VTrak E5000 will be demonstrated in a workflow environment bringing 16G Fibre Channel connectivity combined with 12G SAS. The VTrak E5000 will be shipping this summer. Promise offers a complete shared storage solution featuring Thunderbolt 3 for 4K environments through its Pegasus3, SAN Link 3 and VTrak A-Class offerings. Promise will be demonstrating these in an invitation-only private suite -- #S201LMR in the Upper South Hall. For more information, visit www.promise.com/nab2016 and follow Promise Technology on LinkedIn, Facebook or Twitter. Promise Technology is a recognized global leader with 28 years of experience in the storage industry. Promise has developed its own enterprise-class hardware and software storage architecture, in addition to complete SAN, NAS and unified storage platform lines. Promise is also committed to providing dynamic software defined storage solutions for vertical markets, including cloud and IT storage solutions, video surveillance storage solutions, rich media storage solutions and much more. With industry leading technology and research and development capabilities, combined with highly experienced global sales and after sales service teams, Promise is at the forefront of the industry with the highest levels of customer satisfaction. Promise Technology is an ISO-9001:2008 and ISO-14001:2004 certified manufacturer with operations and sales and support teams throughout the Americas, EMEA, and APAC regions providing unparalleled service and support to customers around the globe. For more information, visit: www.promise.com. Previewing at NAB, Promise's Pegasus3 lineup addresses the many Windows-based workstations and notebooks already shipping with Thunderbolt 3 ports.